“Russel” is an leading American athletics brand founded in 1902 in Alabama. It is the first company to create the sweatshirt. After Russel became NFL and MLB supplier, it began to use the “R” mark (“Eagle R”) to represent its iconic brand image. 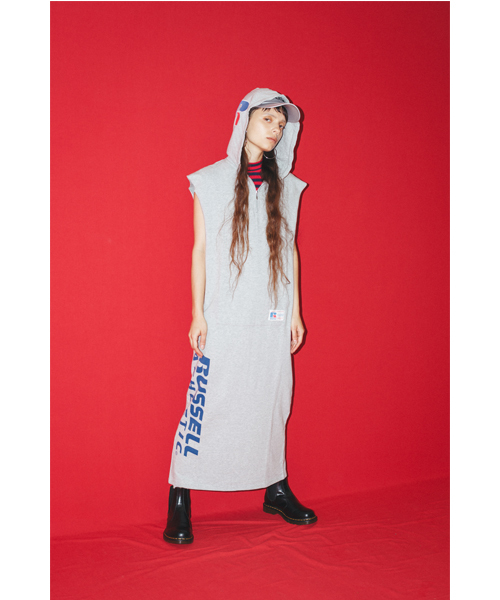 The first collab collection with Russel consists 2 items including a S/S tee and maxi dress. Heavy weight S/S tee features “Eagle R” patch, “RUSSLE ATHLETIC” logo, and Mike Mills logo on left sleeve and RUSSEL ATHLETIC logo on right sleeve.